Oh, I had to join the sew along! I'm sorting my stash and have plenty of scraps! Oh I already caved on the #scrappytripalong, 16 blocks done 20 to go! I have been following the Scrappy Trip...I am thinking about trying this out, looks beautiful and easy. my sewing machine is in the hospital getting better otherwise I would have jumped on that train! And a follower already too! Happy New Year! What a great giveaway! I think I just might have to make one..... I have ALOT of scraps just waiting for the right quilt! I have nor joined the QAL because this is the first I've heard of it. I'm going to go take a closer look. Glad I came on over here. I'm following your blog via email now. Always love a new blog. I just joined the Scrappy Trip Along. I am very excited. I love all the different squares and have been wanting to do one for a long time. 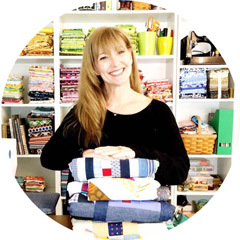 i'll join the scrappy quilt trip - and just subscribed to your blog. Happy New Year! I haven't heard about this sew along yet - off to check it out now!! I'm a new follower by email. Found your blog through the aurifil facebook page. Thanks for the chance to win. Awesome giveaway Kim! I started on mine yesterday and managed 4 blocks. I'm trying to use up all the fabrics I'm not so in love with anymore. Its reading a little blah, so I'm throwing in some pretties, too. I'm thinking about joining the scrappy trip-along - but haven't yet. Winning would be the perfect motivation to jump in. Thanks for the chance. Not yet joined... but I'm a follower! Happy follower- Hope your new year got off to a great start! I have not joined in but it sure looks like fun! Thanks for the chance to win! Oh how I would love this! Joined the blog now and these colors would definately get me out of my comfort zone! I have not joined it yet but I will definitely be checking it out, and following your blog. I haven't joined yet, but oh my goodness it looks like fun! I am already a follower. =) HAPPY NEW YEAR!!! I'm not doing the trip along...I didn't know what it was until now, but I have sooo many scraps, it could be real fun! I love those fabrics! I am already a follower. Ok, Ok I will join the scrappy trip along! I havent joined in yet, but I just landed back on Maui so I should be starting today! I do follow the blog on facebook. The colors of the thread and fabric are so yummy as you said. It would make my day to sew with such beautiful colors. Yeaaa I am gonna start a scrappy today! I needed a way to thin out all my fabric scraps. Thanks. I have not joined the Scrappy Trip Along yet but maybe very soon.... Thanks for the giveaway! Yes yes yes! I have joined the Scrappy Trip Along but I have difficulty gathering enough scraps to make a decent size quilt. So this jell roll will come handy. I'm a new blog follower! Looking forward to much inspiration. Many thanks! I am a new follower via Google Friend Connect! LOVE the fabric & thread you're giving away! Been a follower..Love your blog! I am very excited about starting this quilt..Looking forward to using all my scraps :) Thanks for the chance to win your giveaway :) Happy New Year! I am a new follower, so I haven't joined the Scrappy Trip Along yet, but I fully intend to now! I'm a follower! Sending lots of New Year's (((HUGS))) to all! Yup, I'm a current follower. I haven't joined yet. Too much on my plate right now. But I've enjoyed seeing everyone's updates. Thanks! I've been contemplating a trial block. I like the idea of Ashley at Film In The Fridge, she is using one color or reads as one color fabrics. I might try that. Today is a good day to get started...:) Thanks for a very generous giveaway and for the inspiration! I haven't joined the scrappy trip along. Oddly enough, I don't like the blocks as they're coming together, but MAN are those finished quilts beautiful. I may have to jump in eventually. I'm a follower - Google Reader! I have not joined in the qal yet. But I am a follower of your blog. I started following through my rss reader! I did not join the scrappy trip along - YET! Only because we are moving in a couple of weeks and I have to pack. I'm a follower and have joined the flicker group. trying to figure out which scraps I'm going to use, so this would be a great jump start! I just joined as a follower of your blog. We did some scrappy quilts at a workshop last summer, and were offered the choice of scrappy bargello or trip around the world. I made the bargello, and would (someday) like to do the trip. Aurifil is my favority thread. I have never used Tula Pink, but love the bright colors. I have not joined yet. With a rambunctious almost toddler at home, I barely have time to get the dishes done! But I always bookmark for a few years down the road when I will have the time. I haven't joined the scrappy quilt-a-long yet and don't know that I can commit to the time, although I certainly have enough scraps to make 1 if not 2 quilts. I'm a new follower! and I love TULA! I am a follower... and new year hugs!! I did not join the trip along yet, I discovered it in your block! I just finished my first block. I am watching all the fun... too many UFOs to join in but have this on my Make Someday List! My scrap bin is almost empty, so I don't think I will join in on this lovely trip! I have not joined in yet. I really want to though but my resolution was to finish my current projects before starting new ones and I don't want to break it on the 2nd day of the year! I came across this scrappy quilt the other day and immediately bookmarked it so that I could go through my stuff and see if I had enough stuff to work with. So yes, I will be making one of these. as I only have a little tub of fabrics I would LOVE to use your jelly roll...oh it would be lovely. I just signed up to follow you and I did see the scrappy trip quilt a long a couple days ago. I have a project using my 2 1/2" strips. I bet I can go with 2". We will see. Thanks for the drawing. I haven't joined yet, but I am *so* tempted!!! Everyone's quilts are just looking gorgeous! I started my scrappy trip around the world quilt yesterday!! It's fun watching the quilts come together on flickr! i'm following along ... not up to sewing lately; but keeping track in hopes that i'll be sewing again soon. I will bejiining when my hand is healed. I have not joined yet. Need to finish up my Easy Street First. Haven't join the trip along but if I win maybe I can. I was just thinking about the Scrappy Trip Along ~ wondering what fabric to use for it and The Birds and the Bees would be perfect! Getting ready to join the Trip! What a beautiful packet! I haven't joined yet but I'm thinking that because I love that pattern! I've been following your blog for some time now on my Google Reader ~ really love your blog! Here's a HUG for the New Year and thanks for the giveaway! I am not joining this time, but in the near future. after i am done with bday garments. Thank you for the chance. I have bookmarked things so I can follow the quiltalong from afar. Too many other things going on to start another just yet, but I do have a few jelly rolls that might end up in the consideration later in the year. I am a new follower. Happy New Year! Not yet... but I probably will once my In Your Words quilt is done and dusted for the blog hop next week. They are turning out goreous!! I haven't joined yet but I'm very tempted. Give me another day or two and I'm sure I will have. I'm really trying hard not to start a Scrappy Trip quilt! We'll see how long that lasts! They look so easy! What a great idea! The more ideas for scraps, and jelly rolls, the merrier! Looks like a fun block and quilt. I'm a follower and looking forward another fabudeluxe year! I'm trying to resist as I have a ton of new projects that I am just starting or need to get started, but I'm sure I'll make one at some point. Thanks for the give away! I follow your blog, hugs! Ummmm... That would be :) ROTFL!!! Sorry!!! I have not heard of it yet...Don't know how I overlooked it. Gotta go check it out. I am now a follower, and planning to join the Scappy Sew Along. Would really enjoy the Jelly Roll and Aurifil thread they look beautiful! Happy New Year to you...from South Carolina. I follow you via facebook, email and GFC. I absolutely love those colors of the thread & fabrics in your giveaway. They just shout "SPRING" to me. Hi, I'm a new your follower!!!! Yes, I have joined the Scrappy Tripalong! Hoping to get some more sewing time today! Love these colours- thanks for the chance to win! And I am a long time follower of your blog! Happy New Year! I'm a recent follower. Happy new year and thanks for the giveaway!! I am a follower now! And I joined the Scrappy Trip Sew Along. I really like Bonnie Hunter's pattern so I was in at first read. Thanks for the give a way. I've not joined the trip but when I've sorted my stash out I just might, I also need the children to go back to school so I have time to sew! I started mine this weekend! I was resisting, but I gave in. I'm really enjoying it. I'm a follower. Happy New Year! It's very tempting, but no new projects for now! I have not joined it, considering it but worried I already have too many irons in the fire! I am a relatively new follower, I hope you are having an amazing new year so far! I'm a follower! Love the fabrics! Funny you should mention that! I just joined the Flickr group yesterday, although I have yet to start! Thanks for an amazing giveaway! I have been trying to resist, but if I won this jelly roll I would have to join! I am a new follower of my blog. I haven't joined the Trip Along, but I've admired the pattern at Quiltville already. My scraps piles are growing, so the project is on my list, but I've several more to fininsh first. Sou seguidora.Ainda não.E FELIZ ANO NOVO!! !FELIZ ANO TODO!! !FELIZ ANO INTEIRO.Seja feliz,seja centrípeta. I haven't joined in - but it look mighty tempting! I have just done a tour around blogland and cant wait to try this scrappy Trip Along... some amazing quilts out there with this simple pattern! Happy Happy New Year! I joined your Scrappy Trip Along Blog and I'm a new follower. Very good ideas and I can't wait to see if I win! I want to, but I am going to make some more of my swoon blocks first. I have a couple of other nearly finished items and if I finish those then I think I will be joining in. I am enjoying seeing them all crop up - and I agree Birds and the Bees would be fantastic in a scrappy trip around the world. And I just became a follower of your blog. It looks like a lovely project, but I have too much on to take part sadly. I'll be watching from the sidelines though, through your fb page, and saving up inspiration for another day. Think I need to join the Scrappy Trip Along! That would make a great quilt! I did a test block today and it was so much fun. No, not joining and probably won't :) Too much on the plate, don't want to overindulge. Am a follower and superlove Tula and those Aurifil colors! I am a follower and I think I joined the scrap a long!! Not sure how to do it exactly...tried to find it on flickr. Not good at this kind of stuff on computer. I DO want to start...but promised myself to finish all the un-finished first...what a dilemma! I'm a new follower. Thank you for the inspiration to create. I've been watching everyone's blocks come together with keen interest, but I haven't decided if I should join in yet. I'm still snowed under with projects from last year. ;) Thanks for the chance! Love this! Here is your new year hug ((((( hug ))))). I hope 2013 brings you joy and blessings!! I follow you and continue to be inspired by your posts! I would love to start me, but I am working on a quilt for my daughter's big girl bed and so I am holding off for now. Ooooh that would make a gorgeous quilt!ive joined already and have made 20 blocks so far! They r very addicting! I'm planning on a few more quilts like this since they do come together so quickly! Thanks for the chance to win! Talk about good timing! I just saw the Scrappy Trip Along on Red Pepper yesterday and I've been thinking about it all day today. I wondered about a jelly roll too! I haven't started one yet, but it's on "my list". Thanks for the giveaway! I now follow your blog. Love the post about FMQ'ing your glove :) So glad your finger wasn't stitched too! I have not done scrappy...:( big sad face..